Come to think of it, there's nothing that 100 pounds of liposuction, a new liver, and a career change wouldn't cure. I laughed for about five minutes, then I cried because of my own consumerist, materialist, hedonist mentality. 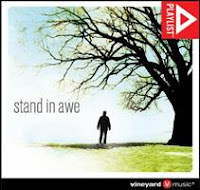 Vineyard Music has traditionally produced songs majoring on the love and presence of God. In this their latest album, Stand In Awe, due out July 10th, many of the songs are centered on the person and work of Christ. The Church will find these songs more useful and edifying than most Contemporary Praise & Worship songs as worshippers will be challenged to dive into the deeper waters of the faith. Accompanying the thoughtful lyrics of these songs are beautifully crafted melodies together leaving us no choice but to stand in awe of our great Savior. ...and I composed track four, "Christ Is Exalted." Have a listen. "Reform worship." is an opportunity for us to better serve the church by improving our theological and practical understanding of worship. Ask 100 people to define worship and you'll get 150 different answers. Definitions will range from "mass" to "praise choruses" to "a life pleasing to God." Many will mention something about their heart of passion and love for God, while others will speak of blessings of heavenly fire and rain. Some see worship as adoring and glorifying God, and many see it as a time for God to adore them. Is worship an object or an action? A means to an end or an end in itself? Is it for God or for us? Does worship include all of these things? The purpose of this blog is to discover God's definition of worship and to conform our ways to His. There are many good and exciting things happening in the church today concerning worship. At the same time there are several beliefs, practices, and cultural accommodations that are not compatible with God's ways. We will be addressing these issues in this blog.